Chinese Artichokes (Stachys affinis): growing, planting, caring. Stachys affinis, commonly called crosne or Chinese artichoke, is a perennial herbaceous plant of the family Lamiaceae, originating from China. 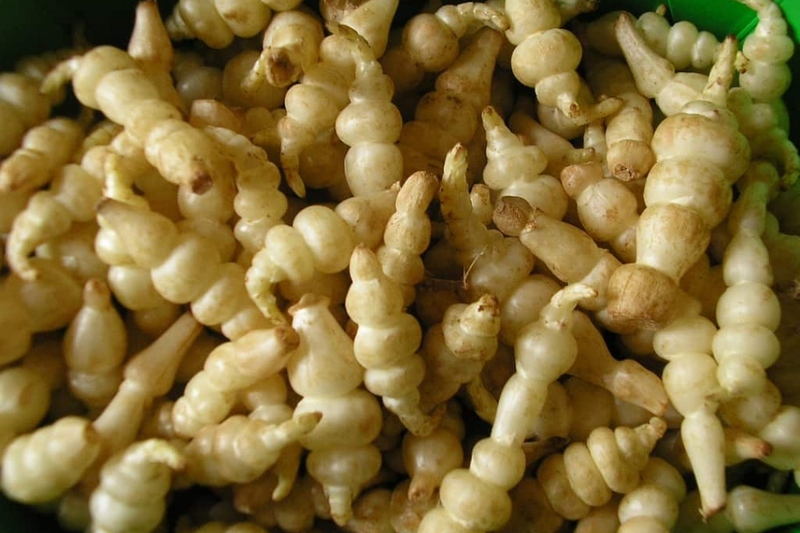 Its rhizome can be grown and eaten as a root vegetable with a very delicate and subtle taste. A member of the mint family, and one of the easiest perennial vegetables to grow in a temperate garden. beware : Its rhizomes run under rock edges, below raised beds, and through other dense plants. But since it is a delicious, nutritious plant, it’s easy enough to weed it and get a nice meal from it ! To grow crosnes you need a well drained location - otherwise the winter harvest will be difficult - in full sun. Do not plant your crosnes too early; wait until the end of the frosts, when the soil is above 10 ° C in depth: from mid-March in mild weather, 15 to 45 days later in other regions. The soil should be loose, unpacked (by you and your spade, or by earthworms that came to feed on a young compost brought in advance) and free of stones that hinder the formation of tubers. An organic amendment incorporated in the topsoil before winter is ideal. Plant your tubers in spaced pits of at least 40 cm, with 40 cm between each plant on the row, 10 cm deep. Alternative planting: it is also possible to simply lay the crosnes on the surface of the soil, and cover them with a mulch of 15-20 cm of compost, or mulch, or a mixture of both. If you have crosnes in bucket, wait for the frosts to finish, and the soil to be at 10 ° C deep: from mid-March in mild weather, 15 to 45 days later in other areas. The soil should be loose, unpacked (by you and your spade, or by the worms that would have come to feed on a young compost brought in advance) and free of stones that interfere. Crosnes appreciate humidity, provided they have a well drained soil. In summer they hate drought, so water them if your mulching is not thick enough. It takes a lot of water for each watering because the crosnes are buried deeply. The crosnes must be hilled up when the plants are 20 cm high, to multiply the tubers. Pull the soil between the rows on the feet to form hummocks. This task is useless if you grow crosnes under mulch, in this case add some lawn mowing regularly. In the fall, dig up the tubers with the tool that's right for you - fork, grelinette, or whatever - without damaging them. Harvest as needed, the crosnes do not hold like potatoes. They must be consumed within three days. Slugs are likely to eat young leaves in the spring - especially if said leaves are the only available food around! So, do not plant too early in the season. The beetle larvae are fond of crosnes, remove them by hand when you plant. The harvest is over? Finish tearing the last roots to make some room.